NOGALES, Mexico (CNS) — Dominican Sister Donna Markham, president and CEO of Catholic Charities USA, grew emotional talking about the harrowing stories she heard from immigrants about the life they left behind to seek refuge in the United States. “The suffering they are going through is unimaginable,” she said after listening to stories from families waiting to apply for asylum at the international border at Nogales in the Mexican state of Sonora. Sister Markham, who recently completed a tour of a detention facility for children in McAllen, Texas, said she wanted to visit Nogales to get the whole story behind the current public debate over immigration. She was joined July 11 at the Nogales Port of Entry by Jesuit Father Sean Carroll, executive director of the Kino Border Initiative, an organization that assists mostly families who have been sent back to Mexico following deportation proceedings. With the large influx of refugees seeking to enter the U.S., Father Carroll, along with other religious-based and nonprofit agencies in Nogales, Arizona, have set up temporary shelters and a check-in system for families seeking to enter the U.S. and to apply for asylum. Were it not for those shelters, families would have to wait in line at the port of entry in the humidity and heat of 100-plus degrees for about two weeks, Father Carroll told Catholic Outlook, newspaper of the Diocese of Tucson, Arizona. The first family Sister Markham met included 11 members, four of whom were young children. They left the Mexican state of Guerrero, one of the poorest and least safe areas in the country. Father Carroll interpreted their story, explaining how their lives had been threatened by a local political party during the recent presidential election. At the border, their biggest fear is that the father and uncle would be detained, the children taken from them, and the women deported. Knowing that risk, they waited anyway because “they were threatened with death” in their hometown, Sister Markham said. While such conditions might easily fall into the classic example of political asylum, Peg Harmon, who is executive director of Catholic Community Services in the Diocese of Tucson and has been a Catholic Charities USA board member, acknowledged that under the current vetting system, there were no guarantees. Another family — two women and two young children — also spoke to Sister Markham. One woman held a young girl close to her who appeared to be no older than 9 and was crying inconsolably. The mother, also from Guerrero, spoke of her husband being taken and her daughter’s life being threatened. She was with another woman, with a son about same age. They had tried to cross into the U.S. in January but were stopped and deported in February. Under current U.S. policy, they would not be eligible to enter the country because of the previous attempt, but have no other place to go. Sister Maria Engracia Robles Robles, a Missionary Sister of the Eucharist, works at a “comedor” — a combined soup kitchen and food pantry — run by Kino Border Initiative in Nogales, Sonora. As she listened to the families’ stories, she used her cellphone to put their names on the list of applicants waiting to file for asylum. Several people passing the families as they entered the U.S. from Mexico offered them candy and money. Local charities also supplied blankets and water bottles, kept in large coolers, at the border station. Following her meeting with the families, Sister Markham said there were two things she hoped to accomplish when she returns to her organization’s national headquarters outside Washington. “We need to call all believers to prayer, and we have to educate people who don’t have the opportunity to come here,” she said. 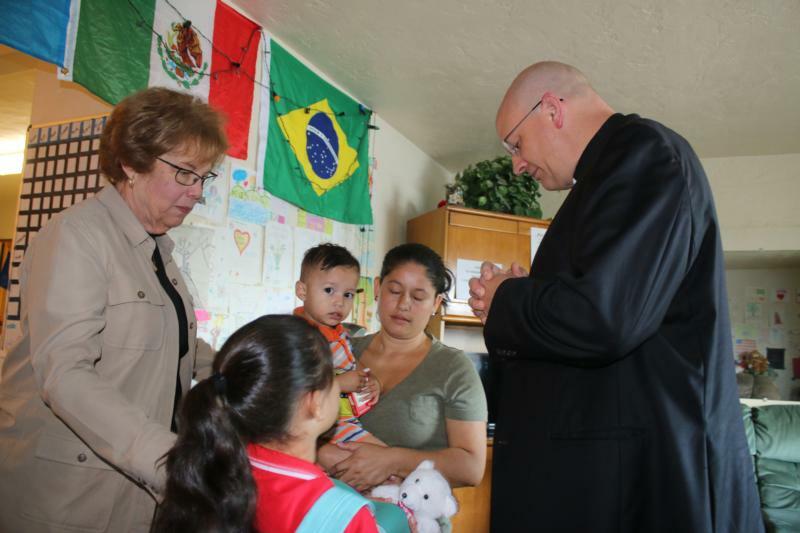 The next day in Tucson, Sister Markham was joined by Bishop Edward J. Weisenburger of Tucson at Casa Alitas, a family shelter run by Catholic Community Services. Casa Alitas receives families in transition from Immigration and Customs Enforcement, or ICE, after being processed from the border and immigration court. Early July 12, two families were preparing to leave Casa Alitas and another four were being placed there. When the bishop and Sister Markham arrived, Olga, a Honduran refugee, was preparing to leave with her two children to board a bus for a three-day trip to stay with family in Baltimore. A few hours later, Valentia, a Mexican native, was leaving with her two children for her own cross-country trip to a community in New Jersey. Soon the Casa Alitas staff welcomed new families — three from Brazil and one from Mexico — brought to the facility by ICE. Sister Markham visited the home the night before and had a chance to spend some time with the departing families. During her morning visit, she gave hugs and smiles to the familiar faces, and later, interviews with local media who arrived to document the visit. “Our goal is to do everything we can to see that these families are treated with dignity,” she told one reporter. A glance around the now-crowded living area revealed weary women and children, some of whom looked ready for a nap. Some needed clothing, which was available from a supply room. The smell of a hot breakfast began to waft out of the kitchen where signs and wipe boards and children’s drawings created a homey atmosphere. “I have a big heart,” she explained, smiling again.